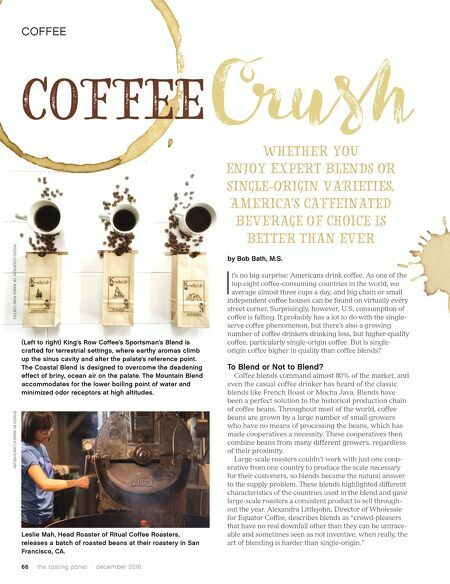 66 / the tasting panel / december 2016 COFFEE Coffee Cru Whether You Enjoy Expert Blends or Single-Origin Varieties, America's Caffeinated Beverage of Choice Is Better Than Ever I t's no big surprise: Americans drink coffee. As one of the top eight coffee-consuming countries in the world, we average almost three cups a day, and big chain or small independent coffee houses can be found on virtually every street corner. Surprisingly, however, U.S. consumption of coffee is falling. It probably has a lot to do with the single- serve coffee phenomenon, but there's also a growing number of coffee drinkers drinking less, but higher-quality coffee, particularly single-origin coffee. But is single- origin coffee higher in quality than coffee blends? To Blend or Not to Blend? Coffee blends command almost 80% of the market, and even the casual coffee drinker has heard of the classic blends like French Roast or Mocha Java. Blends have been a perfect solution to the historical production chain of coffee beans. Throughout most of the world, coffee beans are grown by a large number of small growers who have no means of processing the beans, which has made cooperatives a necessity. These cooperatives then combine beans from many different growers, regardless of their proximity. Large-scale roasters couldn't work with just one coop- erative from one country to produce the scale necessary for their customers, so blends became the natural answer to the supply problem. These blends highlighted different characteristics of the countries used in the blend and gave large-scale roasters a consistent product to sell through- out the year. 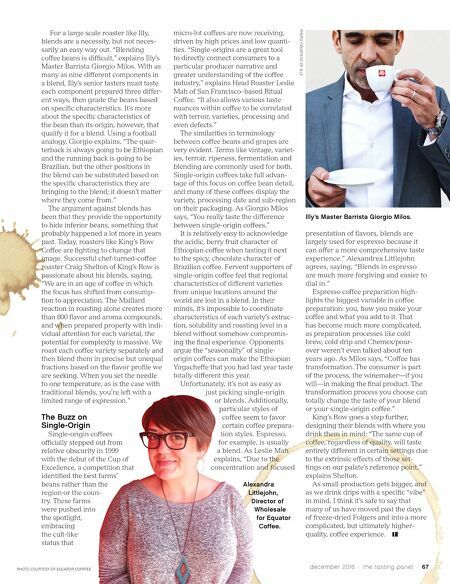 Alexandra Littlejohn, Director of Wholesale for Equator Coffee, describes blends as "crowd-pleasers that have no real downfall other than they can be untrace- able and sometimes seen as not inventive, when really, the art of blending is harder than single-origin." PHOTO COURTESY OF KINGS ROW COFFEE (Left to right) King's Row Coffee's Sportsman's Blend is crafted for terrestrial settings, where earthy aromas climb up the sinus cavity and alter the palate's reference point. The Coastal Blend is designed to overcome the deadening effect of briny, ocean air on the palate. The Mountain Blend accommodates for the lower boiling point of water and minimized odor receptors at high altitudes. Leslie Mah, Head Roaster of Ritual Coffee Roasters, releases a batch of roasted beans at their roastery in San Francisco, CA. PHOTO BY AMBER CANTERBURY by Bob Bath, M.S.